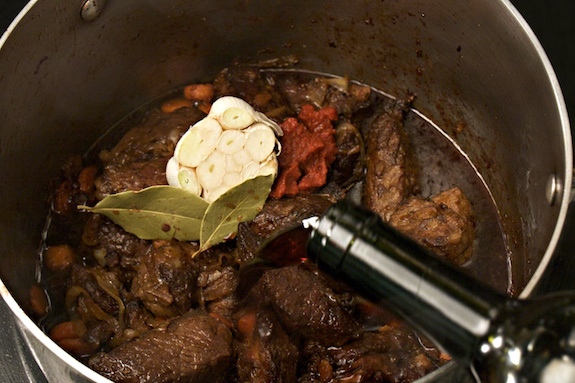 Posted in entrees, French, recipe by Antonio Tahhan on March 16th, 2010. You can follow any responses to this entry through the RSS 2.0 feed. You can leave a response, or trackback from your own site. Ah, that is my favorite kind of dish, the one that doesn’t need to be watched (well, after a certain point). Beautiful. I’m not sure who I’d want to meet yet. I feel like I have trouble connecting with the ones I do know! Oh, man, Tony the last shot you took with the dish on top of the mashed potatoes – that looks sooo good! 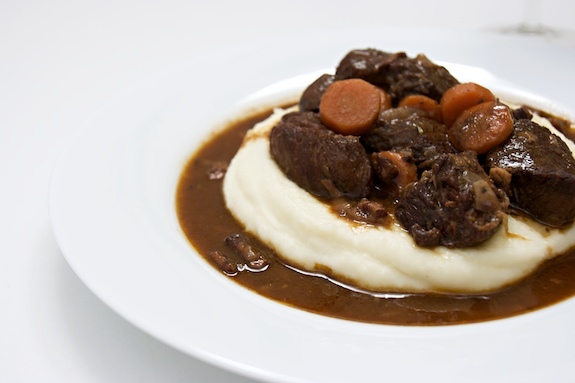 This is such a great, classic dish with classic techniques, it’s something everyone should make. Makes me want to make it this week. You take beautiful photos, Antonio. This is a great post — so informative and well developed. Plus, I love the photos! 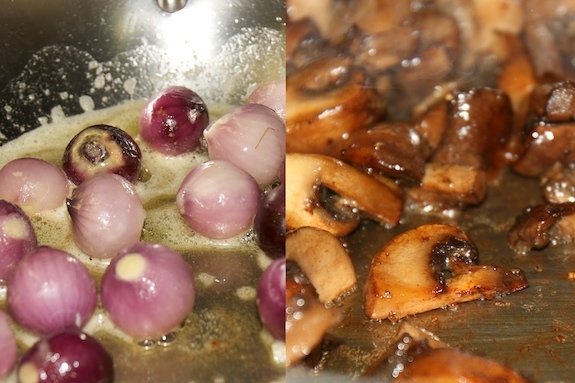 The sauteeing pearl onions — incredible! Gorgeous photos, and now I’m hungry. I can’t imagine sleeping while this was simmering in the oven though, I’d be waking up to that wonderful aroma throughout the night! If there is one thing I have learned from Julia Child it’s that you need to give things their space, not crowd the pan. Browning meat, searing mushrooms, and on and on. This is one of my favorite recipes. 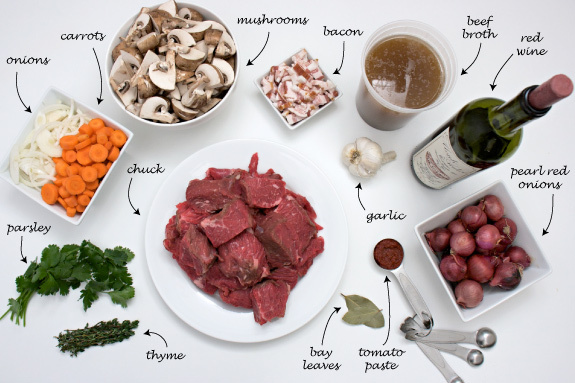 Boeuf Bourguignon is the epitomy of comfort food … and you’ve honored Julia well. Thanks Elaine! Julia Child’s original recipe calls for either boiled potatoes or buttered noodles as a side. I’m glad to see I’m not the only one who thinks the mashed potatoes were a good idea! Thanks Shari! 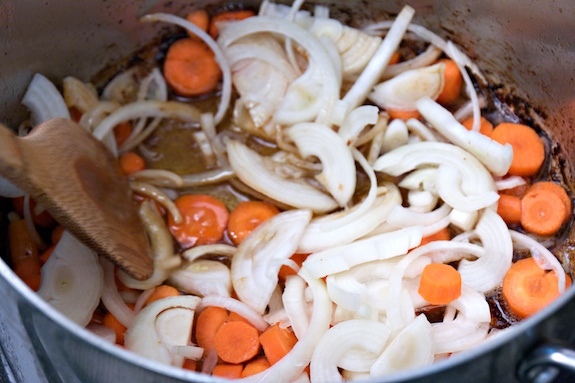 Onions and butter — so simple, but they were incredibly tasty! This was the first dish I made in American following Julia Child’s recipe to the letter; which made me a fan of Julia ever since. When I first starting reading food blogs, yours was the first I came across that showed mis-en-place. It makes so much sense and Julia would be proud! Gorgeous! It’s a classic I have yet to try making myself, but you’ve provided some extra inspiration for me! hi Sabine: Sizzling occurs naturally when hot fat comes in contact with moisture. 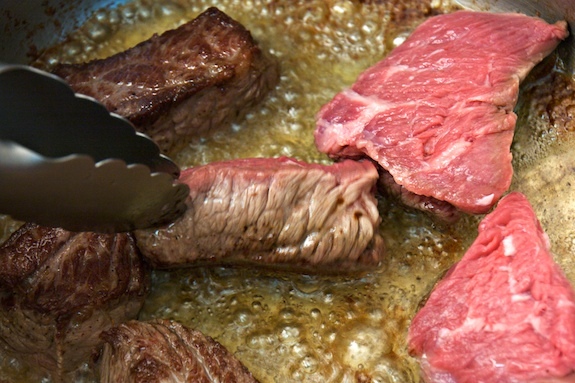 In order to develop a good sear, and avoid excess sizzling, it is important that your meat is dry. I suggest patting the meat with a paper towel to remove some of the moisture from the surface. I also use a large pot with tall sides to avoid splattering and I handle the meat with tongs to avoid getting my hands close to the sizzling. I hope these tips help for next time!